Last week I caught the train up to York and then cycled from there to Hull. This is only a 37-mile trip. However, I managed to stretch the journey out to 190 miles over two days. This was the ultimate scenic route - taking in the Yorkshire Dales, the North York Moors, and the Yorkshire Wolds. It was an early start. I was out of the house at 5am to get the 6.15 from Kings Cross up to York. 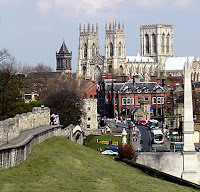 By 9am I was whizzing down the road past York race course and out to the burbs, ready to hit the road to the Dales. There was no hanging around! The sun was out and the roads were quite quiet. At lunchtime I reached Pateley Bridge. This was where the serious climbing began. A 16% climb up Greenhow Hill. A real leg tester. There then followed a series of 16 percenters - either going up - eek - or down, phew! In fact, I think for most of the ride 16% was the order of the day. A lot of the hills around the Dales, barring a few infamous ones are of roughly that gradient. I took things in my stride as I had a pack on my back. I had promised myself that I would just travel with a light day pack. But it never quite works out that way. 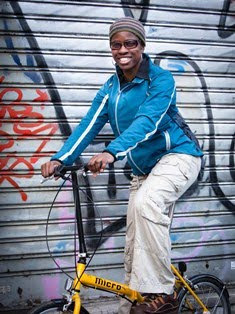 There's always an extra bit of clothing, a book or more gadgets that you feel you need to take. And when you've got a succession of hills to climb it's not easy to lug all that up. I would pay for it later. I also had to make sure I ate regularly. The previous night I had thrown up all my dinner, for some unknown reason, so I had effectively set off on an empty stomach. Not the best start for an all day ride. 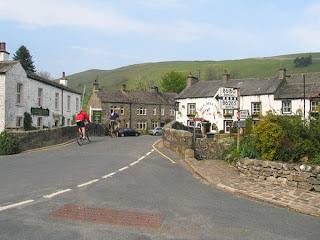 By the time I reached Grassington I realised that my plan to ride up the terrible trio of Park Rash, Fleet Moss and Buttertubs Pass would have to go out the window if I wanted to reach my lodgings in reasonable time. I wasn't quite ready to tackle either of the 25% gradient roads that led out of Kettlewell. So instead I opted for the "easier" Aysgarth road with (you've guessed it) a 16% gradient! However, once I crested the hill out of Buckden, everything on the other side turned grey. The sky looked threatening, and the roads were wet like there'd just been a downpour. All the cars had their headlights on. I judged this to just be a micro-climate, for once at Aysgarth everything was fine again. From here, the roads became just merely rolling, as opposed to steep. Then from Leyburn, the roads were pretty flat as I realised I had now left the Yorkshire Dales national park and was just in fairly bog standard farmland/countryside. Bye bye Dales ! Unfortunately, there was nothing much to savour as the heavens opened while I was heading towards Masham. Shame, as I would've liked to stop and sample a tipple from the Black Sheep and/or Theakston breweries. I just had to keep riding to stay warm. Another time, eh. So the rain stayed pretty much for the remainder of my ride - about 40miles. Thirsk was another place which was probably very pleasant in the sunshine, but on this day things were just miserable. The misery was underscored by the numerous warnings of the gradient ahead on the A170 to Helmsley. 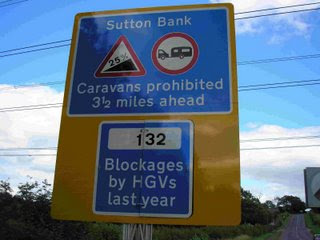 "Sutton Bank - 25% - take care - check your crawler gear - unsuitable for caravans". There were also signs showing how many road blocks there had been due to lorries getting stuck and conking out on the tough gradient. Ok, so we know of 25% gradients around the country that people speak of with fear and loathing. Generally, these can be found on quiet roads, and there are also alternative routes for avoiding these roads. However, the freakish thing about Sutton Bank is that it's a main road - the A170 between Thirsk and Scarborough. Crikey, I have never seen a main road so steep. It isn't just one ramp at this gradient. There are about four or five slopes over 1 mile - 16%, 18%, 30%, 20% and 19% - these are interspersed with 12% "relaxation points". My back was beginning to ache now and I was too cooked to be able to ride the whole thing. So, regrettably I had to complete the climb on foot. I just say, thank God for cleat covers ! At the top you are then rewarded with the Ryedale Visitor Centre which has a cafe and other facilities - it was closed by the time I got there though - shame. At such a high vantage point and with all that exposure to the wind it is not surprising that this is the base for the Yorkshire Gliding Club. The views over the Hambleton Hills and the Vale of York are apparently spectacular, but in the evening gloom and wet I didn't get to see much. In any case I was too cold and wet to stop and check anything out. It was just a case of focusing on the road ahead and pushing on homewards. The rest of the ride along the A170 was straightforward, though it was so dark that I thought the time must have been 9pm. In fact it was only 7pm. Gosh, it is grim up North! To my left, I could see the Yorkshire Moors villages, to my right was woodland and roads (known as banks) that dipped downhill at scary gradients. Make no bones about it. The entry into the North York Moors national park is via one bank or another, making for a fierce introduction to what is in stall for the rest of the ride ! By the time I reached the Youth Hostel at Helmsley it was almost 8pm. I think I deserved my plate of pasta and rhubarb crumble desert. Sounds a great trip. Greenhow hill is no joke; you keep thinking you're at the top and then there's another section of 16%. I was up there this half term, the view I can confirm from the top is indeed breathtaking. Go do it again is all I can say - or if you have never been you should. Thanks Lucy, I hope to be back up there some time next year, and look forward to the view. By the way tejvan I love those photos of the Yorkshire Dales. Well done on your result at the National Hill Climb.